Owing to our expertise in this domain, we are engaged in manufacturing and trading Semi-Automatic Strapping Machine, which is enough capable of tightening and fastening various kinds of straps around the packages. 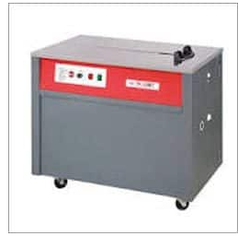 This machine is utilized for wooden boxes, binding paper cartons for packing polypropylene straps. The machine is designed with high precision, thus it has high accuracy and excellent performance with fine finish. Our clients can avail this Semi-Automatic Strapping Machine from us at industry leading prices. ONE TOUCH & EASY OPERATION : Turn the power on and you are ready to strap your packages. Motor stops automatically when not in use within preset 60 seconds to save energy and prolong motor life. ADVANCED P.C.B. CONTROL SYSTEM : New Easy-to-Replace printed circuit board (P C B), Controls feeding, tensioning, welding, sealing, cooling of strap welds as well as other functions of the machine for trouble-free and low-operations. Viha Enterprises was established in the year 2007. We are Manufacturer, Wholesaler, Trader And Service Provider of Strapping Machine, Rapping Machines, Strapping Tools, etc. We are counted as prominent name in this business, engaged in offering a wide range of Manual Strapping Machine to our clients. This Manual Strapping Machine is extensively used in different industries for packing carton. As per the demand of our clients, we are providing this product at market leading prices. We are ranked amongst the renowned organizations that are engaged in offering the best quality range of Packway Box Strapping Machine. This strapping machine is highly demanded by our clients for strapping various items owing to its easy to operate and low maintenance features.